Lagging-strand genes accumulate more deleterious mutations. Genes are thus preferably located on the leading strand, an observation known as strand-biased gene distribution (SGD). Despite of this mechanistic understanding, a satisfactory quantitative model is still lacking. Replication-transcription-collisions induce stalling of the replication machinery, expose DNA to various attacks, and are followed by error-prone repairs. We found that mutational biases in non-transcribed regions can explain ~71% of the variations in SGDs in 1,552 genomes, supporting the mutagenesis origin of SGD. Mutational biases introduce energetically cheaper nucleotides on the lagging strand, and result in more expensive protein products; consistently, the cost difference between the two strands explains ~50% of the variance in SGDs. Protein costs decrease with increasing gene expression. At similar expression levels, protein products of leading-strand genes are generally cheaper than lagging-strand genes; however, highly-expressed lagging genes are still cheaper than lowly-expressed leading genes. Selection for energy efficiency thus drives some genes to the leading strand, especially those highly expressed and essential, but certainly not all genes. 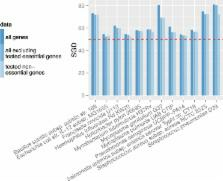 Stronger mutational biases are often associated with low-GC genomes; as low-GC genes encode expensive proteins, low-GC genomes thus tend to have stronger SGDs to alleviate the stronger pressure on efficient energy usage. The Gene Expression Omnibus (GEO, http://www.ncbi.nlm.nih.gov/geo/) is an international public repository for high-throughput microarray and next-generation sequence functional genomic data sets submitted by the research community. The resource supports archiving of raw data, processed data and metadata which are indexed, cross-linked and searchable. All data are freely available for download in a variety of formats. GEO also provides several web-based tools and strategies to assist users to query, analyse and visualize data. This article reports current status and recent database developments, including the release of GEO2R, an R-based web application that helps users analyse GEO data. GenBank® (http://www.ncbi.nlm.nih.gov) is a comprehensive database that contains publicly available nucleotide sequences for almost 260 000 formally described species. These sequences are obtained primarily through submissions from individual laboratories and batch submissions from large-scale sequencing projects, including whole-genome shotgun (WGS) and environmental sampling projects. Most submissions are made using the web-based BankIt or standalone Sequin programs, and GenBank staff assigns accession numbers upon data receipt. Daily data exchange with the European Nucleotide Archive (ENA) and the DNA Data Bank of Japan (DDBJ) ensures worldwide coverage. GenBank is accessible through the NCBI Entrez retrieval system, which integrates data from the major DNA and protein sequence databases along with taxonomy, genome, mapping, protein structure and domain information, and the biomedical journal literature via PubMed. BLAST provides sequence similarity searches of GenBank and other sequence databases. Complete bimonthly releases and daily updates of the GenBank database are available by FTP. To access GenBank and its related retrieval and analysis services, begin at the NCBI home page: www.ncbi.nlm.nih.gov. Transposable element insertion location bias and the dynamics of gene drive in mosquito populations.